It's that time again, folks! We have a brand new Simon Says Stamp Wednesday Challenge for you! This week it's all about the food and drink. We want to see you create something with a food and/or drink theme. No, we aren't asking you to stamp with spaghetti sauce. Although, if you wanna go ahead and give that a shot, nobody is stopping you. I'm just sayin'. For reals, though. Probs don't do that, k? K. Glad we had this little chat. This week we are featuring Simon Says Stamp exclusive products. Many of the girls reached for some of the fabulous new goodies in the shop, but for this one, I simply HAD to pull out a set of old favorites! It HAD to happen, you guys. For reals. Yup. I pulled out the good ol' Adult Beverages collection. I used the image stamps, sentiment stamps, AND the dies for this one (you can find specific supply links below). I also loaded this sucker with sequins because... shiny. Now it's YOUR turn! Create something fabulous using food and/or drink as your inspiration and then link it up over on the Simon Says Stamp Wednesday Challenge blog for your chance to win a $50 Gift Voucher to the Simon Says Stamp Store! Stamptember is coming, folks! This is a GOOD time to win!!! You can find the complete supply list for my card, along with affiliate links to the products below. Your support is always appreciated when you order through my links. Thank you! So fun, Jenn! And I love the postage-edges on everything! 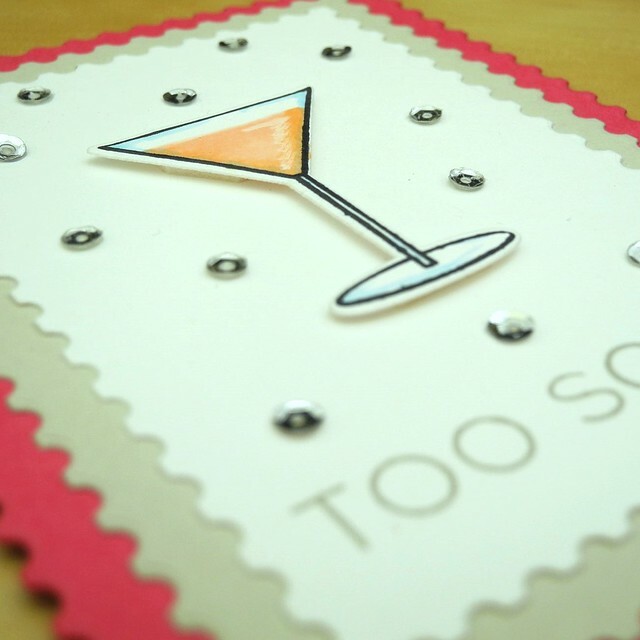 A gorgeous card Jennifer, I agree with Lols, anyway if that is champagne it's celebratory so it's never too soon!!! The sequins seem like champagne bubbles!! Love the layered postage stamp panels. Never too soon for a drink! ;) Beautiful card, Jen! In answer to your sentiment - never! 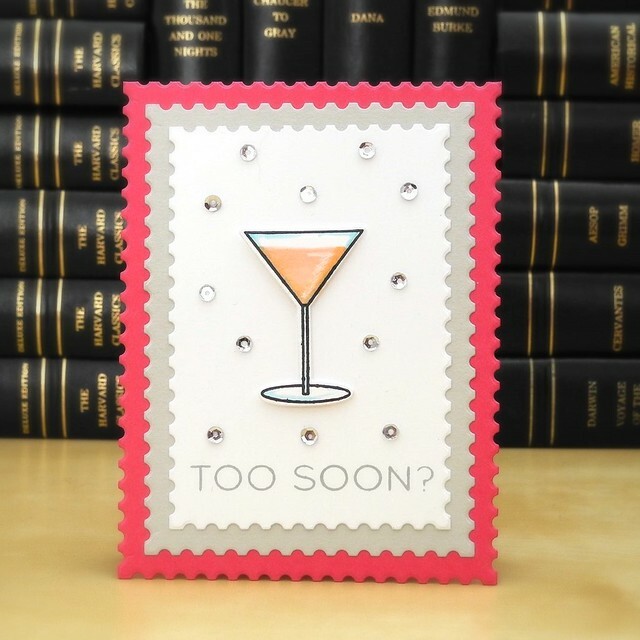 Especially when it's something as inviting as the martini on your card! And you gotta do the shiny sequins and the postage stamp frames - perfection! Thanks so much for sharing!